Sprowston is situated just to the northeast of Norwich City, with which it shares its southern border. It is the largest parish in Norfolk, containing some 950 hectares, and has over 14,000 residents, making it the most populous parish in the Broadland local government district. 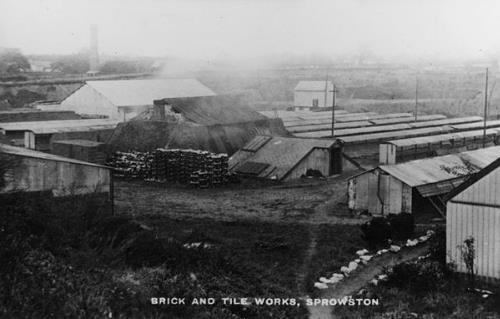 The name ‘Sprowston’ derives from the Old English for Sprow’s settlement. Unsurprisingly the parish contains a large number of residential properties, but some agricultural land survives in the north and east of the parish. Also to the north are the remains of Sprowston and Tolls Hill Woods, as well as the extensive landscape of Sprowston Hall Park. It is on this site that the earliest dated archaeological features have been recorded, comprising a prehistoric ditch and post hole (NHER 36799) excavated in conjunction with a variety of worked flint tools and some pottery sherds. A number of other early objects have also been recovered, including prehistoric flints (NHER 37170, NHER 41872), a Mesolithic axehead (NHER 25453) and adze (NHER 8144), as well as a number of Neolithic axeheads (NHER 8157, NHER 14892, NHER 21482, NHER 25453). A Bronze Age cremation urn (NHER 8113) has also been recovered from this area, as well as two Early Bronze Age barbed and tanged flint arrowheads (NHER 8112, NHER 12768) and a flint dagger (NHER 14338). As with many parishes, Iron Age material is scarce, however it is possible that the postulated Roman road from Brampton to Thorpe St Andrew (NHER 7598), which runs through Sprowston. Roman finds are also limited, and largely comprise coins (NHER 8114, NHER 33114, NHER 41872), although excitingly a late Roman military strap end (NHER 21358) has also been recovered. Three Saxon stirrup mounts have also been recovered (NHER 25895, NHER 33114, NHER 33928). Although evidence of Saxon period structures is rare, soilmarks in the western corner of the parish indicate the possible presence of Early Saxon period grubenhauser (NHER 21127). Unfortunately the listing in the Domesday Book is brief, but the church of St Mary and St Margaret (NHER 8138) is known to have had an early medieval, or perhaps even Late Saxon round tower. The church itself is predominantly 14th century in date, with clerestory, chapel and some windows of the 15th century and major alterations under the prolific Norfolk architect Boardman during 1889 to 1890. However of particular interest are the remarkable tombs contained within the church, the earliest of which dates to 1559. The church dominates what we know of the medieval landscape of Sprowston, but documentary evidence indicates the presence of a number of medieval roads crossing the parish. These comprise Ravensgate Way (NHER 8127), which ran from Norwich to Rackheath, Horning Ferrry Way (NHER 8128), which appears to have had a similar route, and Ranworth Way (NHER 8166) which followed the parish boundary between Great and Little Plumstead, Rackheath, Sprowston and Thorpe St Andrew. The most substantial building in the parish is Sprowston Hall (NHER 8159), originally built in the 16th century, but extensively rebuilt between 1872 and 1876. The house is of red brick, in two and three storeys, and was constructed on an ‘improved Elizabethan pattern’. Other buildings of interest include 18th century Oak Lodge Farmhouse (NHER 46105), and the Church of St Cuthbert (NHER 13441), which was built in 1886 by A. R. G. Fleming and contains the original octagonal Perpendicular style font from Kempstone Church. The former site of Dove Yard brick works (NHER 12925), which had Hoffman kilns and remained active until 1937, has also been recorded. Ruymps Brickworks, Sprowston. Courtesy of Norfolk County Council Library and Information Service. 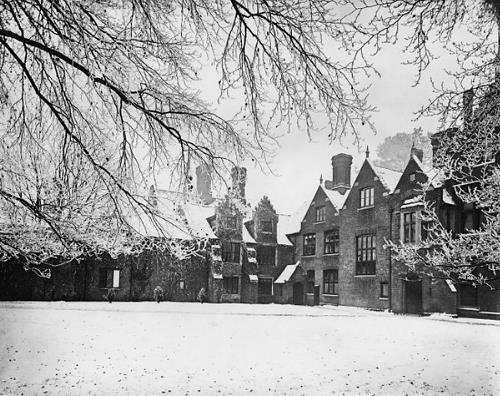 From more recent history, Sprowston Court (NHER 35085) is also of interest. Although this property has been subdivided, it was initially built as a single domicile in 1914, in a Georgian style of 1714 and using red, orange and black bricks which were specially made in Belgium. Even more recent is the Royal Observer Corps Headquarters building on Chartwell Road (NHER 26488), which from 1961 to 1991 was the headquarters of fifty-five Royal Observer Corps Cold War underground monitoring posts in Norfolk, whose purpose was to monitor fall-out in the event of a nuclear strike. When sealed, this two-storey semi-sunken structure was designed to be self-sufficient for a week under fall-out conditions. It is now disused and hidden behind advertising hoardings, and sadly access to the site is discouraged. Ruth Fillery-Travis (NLA), 3 May 2007.
http://www.visionofbritain.org.uk/relationships.jsp?u_id=10212522. Accessed: 3 May 2007.
http://www.norfolkmills.co.uk/WindmillsN/sprowston-postmill.html. Accessed: 3 May 2007.
http://en.wikipedia.org/wiki/Sprowston. Accessed: 3 May 2007.